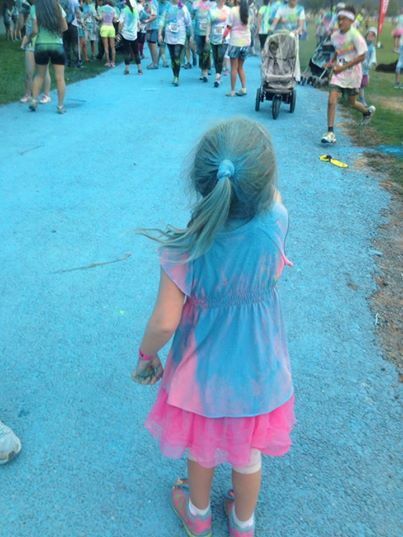 Color Run | Have kids, they said. It'll be fun, they said. Today I did the 5km “Color Run” with Princess. For those who don’t know, it’s “the happiest 5km of your life” – a fun run where they throw paint at you at certain intervals. It’s crazy, ridiculous, awesome fun. We got very painted. And, Princess walked, jogged and skipped the whole way as well which is quite a feat for a 4 year old girl. And so, I felt like a relatively healthy dinner tonight. I went to the supermarket with BoyChild this afternoon and found some Chilli and Lime cashews for only $1.20 a bag (bargain!) and thought they would be a really nice topping on a salad. 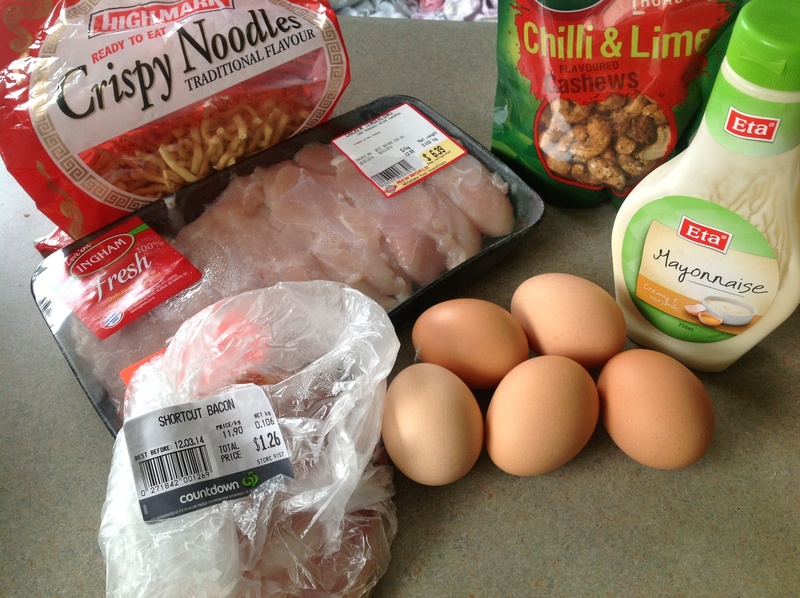 And so Princess and I made Bacon, Chicken and Egg Salad with Crispy Noods and Chilli and Lime Cashews. Cook the chicken in a pan with some oil and a little bit of dried rosemary. When cooked through, set aside. Chop up the bacon and cook that as well. While this is going on, hard boil some eggs. Put together the salad ingredients and mix in the dressing – for the dressing, mix the Mayo, vinegar and sugar together as per your tastes. 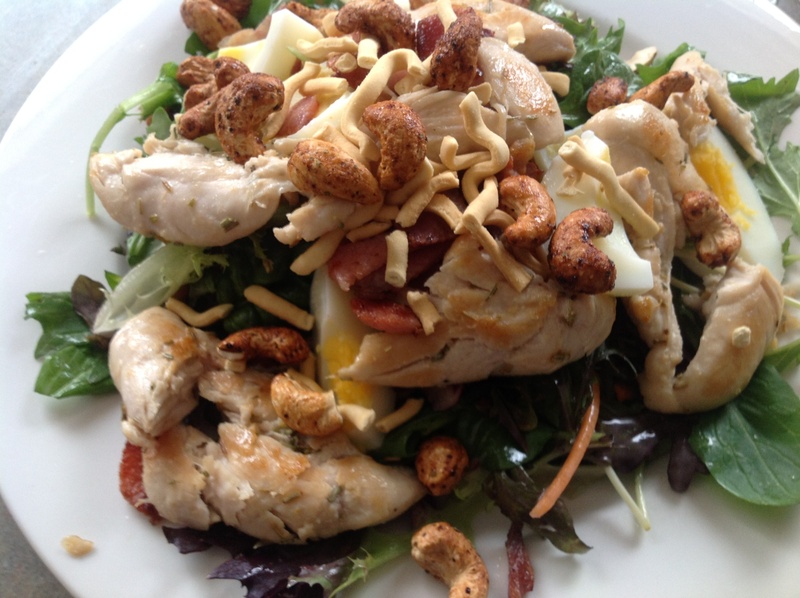 Assemble the salad onto the plate and then top with chicken and bacon. Peel the hard boiled eggs and cut into quarters, add these onto the salad. Top with noodles and cashews. Absolute win. The kids had a variation of this, but their components were placed on their plate separately rather than in a pile (kids are funny about food touching). Mr T was quite excited when his plate was put in front of him, he described it as being “delicious and sensational”. It really was a very filling and delicious meal. Well done, me.